Don’t look now, but Tiger is trying to win the Wyndham Championship – the final tournament he will be in this year. If he wins, he gets to play a few more rounds in the FedEx Cup playoffs for 10 Million bucks. If he gets anything other than a W, he’s packing his bags to go home. I know, you would say if he gets number 2, there is still a chance, if everything else falls his place (a whole bunch of good players starting to play like hackers) – but I know Tiger for a long time (whether he knows me is still the question) – he won’t want to depend on people. He will go for the W. So expect him to play aggressive, do or die, run birdie putts by and probably miss his pars. The first few holes – 5 holes will determine his game. His putting must work. If he pars the first 5 holes, he won’t win. If he birdies them, it will mean that he’s putting well. Unfortunately since I boycotted the robbers called Astro, who is run by crooks – I never agreed to pay the extortion fees they demanded to watch the Golf Channel. So I am only following via my Iphone App, which doesnt have live streaming of Tiger. 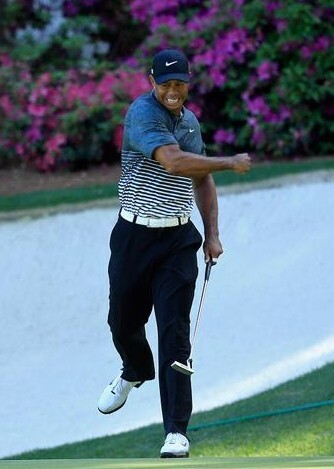 Come on Tiger! Make Gilagolf proud!